Seven-year-old Saoussan writes a letter to her reading buddy explaining how she left her war-torn country and what life in a new country has been like. 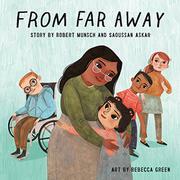 Originally published in 1995 and based on Askar’s experiences as a child in a Toronto school, this now appears with new illustrations and revised text. Sadly, this story has not lost any of its relevance or immediacy. As Saoussan tells her story, readers learn she comes from far away. Though she never says where from, it is understood from her mother’s dress that it is a Muslim country. When war starts her parents decide to leave; in a note at the end of the book readers learn her new home is in Canada. The illustrations depict a very multiethnic school as well as a child in a wheelchair. Life in her new country is not easy. She doesn’t speak English and cannot understand or communicate with her teacher or her classmates. Even something as basic as asking to go to the bathroom—here called a washroom—becomes a trial. Traditional celebrations can also be traumatic: when Saoussan sees a Halloween paper skeleton, memories of war flood back and make her scream. The children’s faces are very expressive and help to further convey the feelings felt on all sides. The simple sentence structure and familiar situations make it easily accessible to young children. A note from a now-grown Askar concludes the book.